Home Courtney, Philippa 4 Steps to bring the Right Person into your life Right Now! 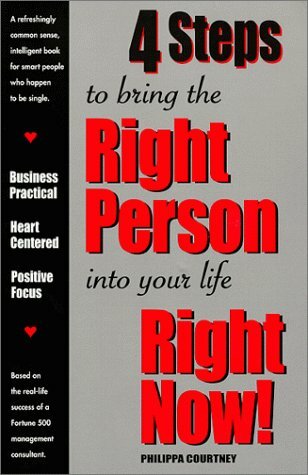 4 Steps to bring the Right Person into your life Right Now! Philippa Courtney, a respected business consultant who advised scientists and engineers at major technological companies, was less successful in her personal life, until she developed a process based on the very principles that worked so well for her clients. This 4 step process produced amazing results for her and then for the students at her popular workshops. Also a former writer of situation comedies, her refreshingly revealing book engages the reader with humorous anecdotes and provides innovative yet practical tools. She substantiates her common sense strategies with real life business and personal examples.